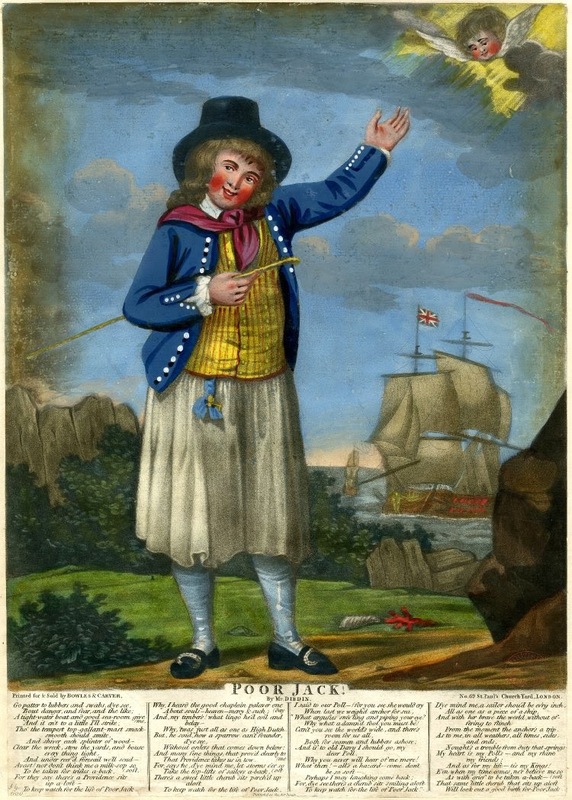 Poor Jack, Charles Dibdin, 1790-1791, British Museum. Jack stands on a rocky shore, looking terribly dapper and gesturing toward a cherub in the heavens. Beyond the outcroppings lie a pair of ships with their yards askew (probably unintentional on the part of the artist). As far as sailor's slop clothes go, Jack is really turned out! His hat is a tall round hat, almost the shape of a coachman's hat. Jack's untamed hair is long and flowing down past his shoulders. The white collar of his shirt is folded neatly over his purple-red neckcloth, which both rests on his shoulder and is tucked into his waistcoat. His waistcoat is double breasted with cloth covered buttons, yellow with narrow vertical red stripes. 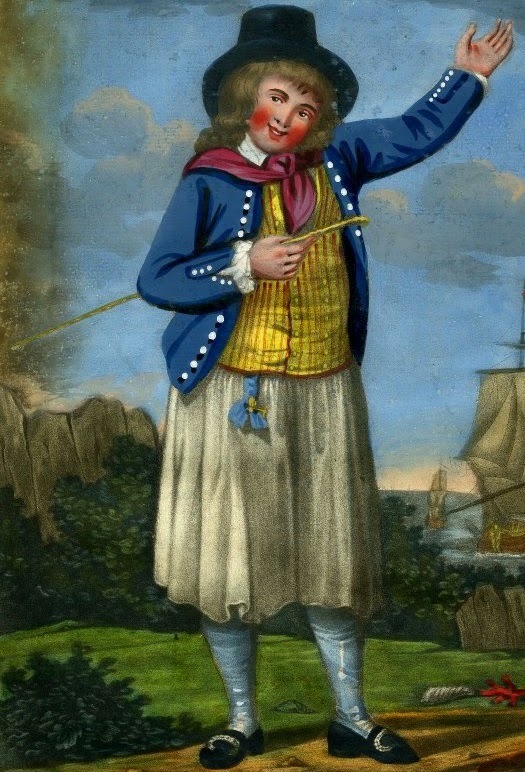 It may be noteworthy how many waistcoats in depictions of sailors are combinations of yellow and red stripes. His jacket ends just below the waist and is a double breasted piece with white metal buttons. There are no pockets, it is unlined, and he wears the familiar slash cuffs. His slops end just below the knee, and a powder blue bow and fob protrudes from beneath his waistcoat. Fobs, often indicating watches, are not common in depictions of sailors. His stockings are a light blue with some white touches. Perhaps they are clocked? They lead into pointed toe shoes with oval paste buckles. The title may declare Jack to be poor, but looking at his clothes I'd say he was doing rather well.